Our bells were installed in the tower during August 2013 by our bell hangers, Nicholson Engineering of Bridport and a team of local volunteers. There are only a few bell hangers in the country and we were delighted that Andrew Nicholson agreed to undertake this work. He made several visits to the Church and we are sure he has provided us with a wonderful peal of six bells. The bells were removed from the tower in bitterly cold weather in February 2013. The bellhanger and the volunteers had a difficult time trying to remove the bells from the old frame because an extra beam had been added, probably in the late 1800's. 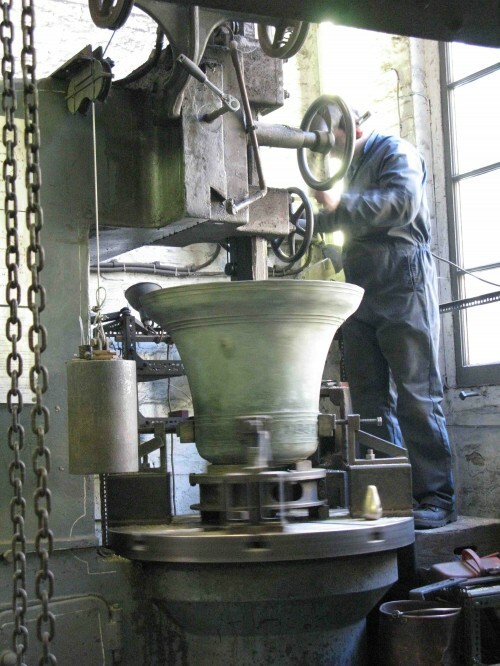 The bells were then taken to Whitechapel Bell Foundry where they were retuned. Three of the bells were found to be cracked so they were repaired by Soundweld of Newmarket. Whitechapel has the distinction of being the oldest manufacturing company in the country and they have an excellent reputation for casting and tuning bells. They cast the Olympic bell as well as the Queen's Jubilee bells that graced the Thames in 2012. 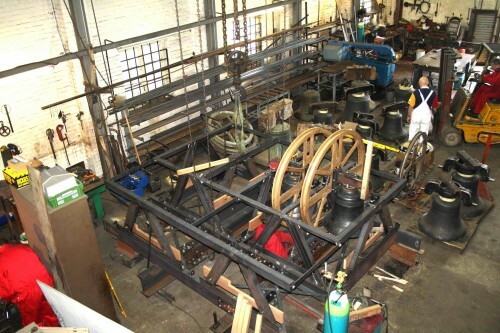 Once tuned they were taken to Nicholson Engineering at Bridport where Andrew and his team built a new bell frame and fittings for the bells. Then comes the exciting bit! Theycame back to Clopton and were installed in the tower, ready for ringing for the next 400 years or so! We know that Nicholson's have a great reputation for producing bells that are musical as well as being relatively easy to handle. Locally he has installed a number of peals, the nearest being at Campsea Ashe. Their bells can be heard on the Campsea Ashe Church website. Perhaps his most famous installation was in the Scilly Isles and they featured on An Island Parish some time ago. These bells can be heard by clicking here. Or visit their website at http://www.scillybells.co.uk. Now that the bells are installed we are training a band of ringers. We started in October 2013 we will be hosting a series of 'taster' sessions. Please contact us if you are interested. Details of the project were reported in the Ringing World on 15th November 2013 (full article available for subscribers).